46th Annual Village Art and Craft Fair. This high quality craft fair sponsored by New Morning Gallery and Bellagio Art-to-Wear, takes place August 4th and 5th 2018 on the grounds of the Cathedral of All Souls in Historic Biltmore Village. Fair hours are Saturday 10am to 7pm and Sunday Noon to 5pm, rain or shine. The fair hosts 114 artists from 16 states, representing the full spectrum of craft media – jewelry, ceramic, wood, fiber, metals, two-dimensional art and more. The craft fair is a great opportunity to encounter new artists (26 are first-time exhibitors) and to talk with crafters one-on-one. 36 artists are from Western North Carolina. Thousands of shoppers from all over the southeast arrive to stroll through the fair, discovering unique gifts for friends, family and themselves! Illustrator and author, Daryl Slaton, has provided the artwork for this year’s poster and t-shirt design. Specializing in whimsical and fantastic imagery, Daryl’s work is fun and memorable. His first Craft Fair design for us was in 2011 and showed three felines springing to life as they escape the confines of a midnight carousel. 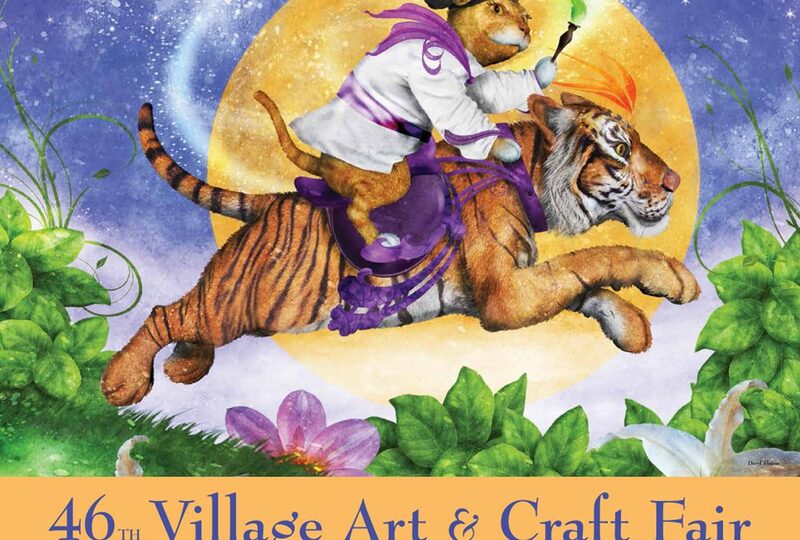 This year’s artistic kitty riding a tiger is sure to be another fan favorite! Outreach program. For more information call 828.274.2831.